I really donâ€™t know what to make of this or how the 7th century civilization of Islam will deal with a 21st century invention. Women who would rather not wear a burqa can now slip around it electronically. Well, thatâ€™s the idea. Muslim men can not control their actions so they must control a womanâ€™s. But not for long. This will keep the imams up at night. A Berlin-based artist has invented a digitally-enabled robe that will send an image of a woman’s face — or anything else — via Bluetooth. 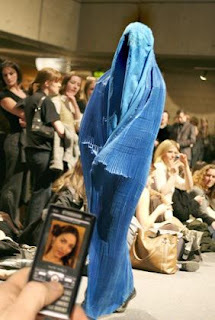 A burqa may not be the flirtiest garment ever invented for women. The highly modest head-to-toe robe even shrouds the eyes, so for centuries it’s been difficult for women wearing them to send suggestive signals to men. But now a German designer has debuted a digitally-enabled burqa that can broadcast a photo of the wearer to nearby mobile phones. Markus Kison calls it the “Charming Burka,” and says it isn’t forbidden by Islamic law. Well, thatâ€™s yet to be seen. Sorry for the pun. Kison says the burqa has a “digital layer” that incorporates a Bluetooth antenna, which lets women “decide for themselves where they want to position themselves virtually.” Nearby mobile phones that also use Bluetooth will light up with any small file a woman chooses to broadcast as her identity — a photo, a cartoon, a text file or even a sound clip. Or perhaps a flash of calf or elbow? Down Mohammad, down. No user commented in " The â€˜Charmingâ€™ Burka. "